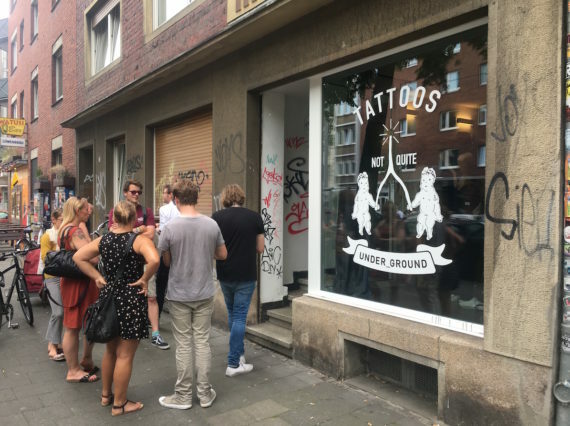 Taking place every ten years, for 2017 Skulptur Projekte Münster presents work by an international line up of around 35 artists who present work in public spaces and museums across the city. Artist and senior lecturer in fine art at the University of Worcester S Mark Gubb reports. I arrived in to Münster on a warm and sunny afternoon, blisters slightly rested after a three-hour train ride from Kassel and two days schlepping around Documenta 14. An immediate right turn out of the station took me through a tunnel under the train tracks. The pedestrian crowds, mixed with a busker’s drumbeat, made me feel like I was at a festival, en route between stages. It quickly became apparent there was no busker and the drums I could hear were coming from speakers set high on the walls. This was a work by Emeka Ogboh, who has also brewed a beer, fermented to the sounds of the city of Lagos, available at a few bars and venues around town. The artist is interested in the potential for sound to inscribe itself on to space and matter and the work provided a shifted perspective on a fairly mundane activity, momentarily lifting me out of the practicality of my situation and transporting me, psychologically, somewhere culturally richer and more active. As a public intervention, Ogboh’s piece could easily be missed by the pedestrians and cyclists doing their best to avoid each other. 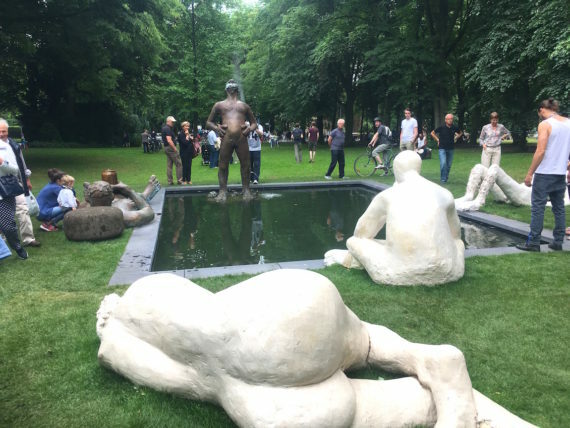 So often, this is how the once every ten years Skulptur Projekte Münster works – quite imposing sculptures and installations are upon you before you even realise. 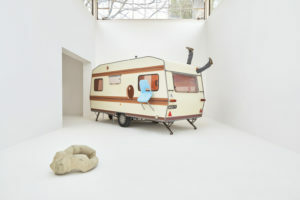 With German curator Kasper Konig at the helm as artistic director, this fifth edition of the project contains new works by around 35 artists, some with pieces over multiple sites and some working collaboratively. 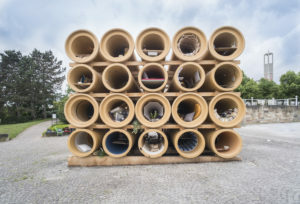 Alongside this are the permanent works from a similar number of artists, gradually collected over previous editions, so there’s a lot to look out for as you wander the pretty streets and parks of this north east German city. By the project’s nature, there’s no over-arching curatorial theme or thread – it’s simply a collection of works responding to the site and situation in which they are found. In saying that, politics abounds and the works are given the freedom to stand on their own two feet, providing a series of unique experiences drawn together under this once-a-decade banner. The scale and nature of the city lends itself very well to the project. It’s quite compact, has a mixture of parkland and water that run around the centre, and it’s nice and flat (unlike Kassel). So while the city provides an ideal backdrop and context for the artworks, the artworks also take you on a literal journey, highlighting the best of what this little city has to offer. As artists always do, the definition of what can be classed as a piece of sculpture on a trail is pushed to its limits, so certain works are only accessible under certain conditions, or at certain times, while others utilise spaces to provide experiences more recognisable as sculptural installations than stand-alone sculpture. Part of me wonders whether this may, in part, be due to the fact that many of the best sites are now taken up by the permanent works, and no-one really wants to put themselves in direct competition with an Oldenburg, a Serra, or a Nauman, do they? This year’s project provides an array of experiences beyond that of simply viewing: you can get a tattoo (Michael Smith), walk across the water in the harbour (Ayşe Erkmen), get lost in an apartment (Gregor Schnieder), walk through the muddy bed of an excavated ice-rink (Pierre Huyghe) or hang out by an art-pond in the park (Nicole Eisenman). The official app is very useful, if you can afford to have data roaming switched on, as it pings up notifications when you’re in the vicinity of past and present works. I’d barely stepped off the bus when my app informed me this work by Lara Favaretto was nearby. Having read about it I wasn’t so interested, but the crowd gathered around it drew me over to what proved to be a surprisingly engaging piece. 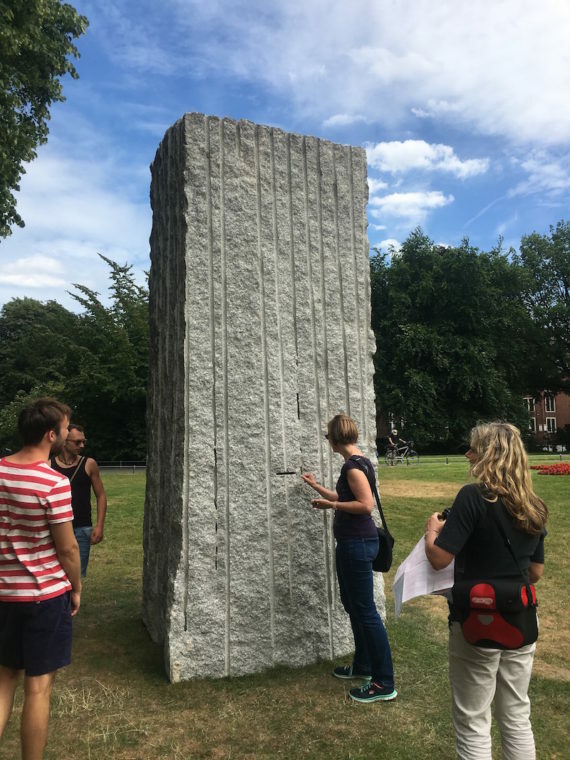 Presented is a large granite block, excavation marks scarring its sides and instantly recognisable as the kind of monolithic piece of material we so often see deposited in municipal centres as artworks or monuments. What makes this different is a slot cut in to one face. Further investigation reveals that the block has been hollowed out and the slot is an invitation to deposit money. This seems entirely in keeping with the visitor tradition of throwing coins in to fountains and other bodies of water and there’s a pleasing depth, in a physical and audio sense, to the slide of the coins as they head down in to the rock’s interior. At the end of the project the plan is for the granite to be repurposed and the money collected donated to the Buren Prisoners Aid Association, to help refugees facing deportation. One of the constant pleasures and frustrations of the project is following the mostly excellent map, only to struggle in locating the artwork. The first piece of Aram Bartholl’s I went looking for, one of three, proved to be such a challenge. I’d nearly given up when some people emerging from an underpass hinted at its location. 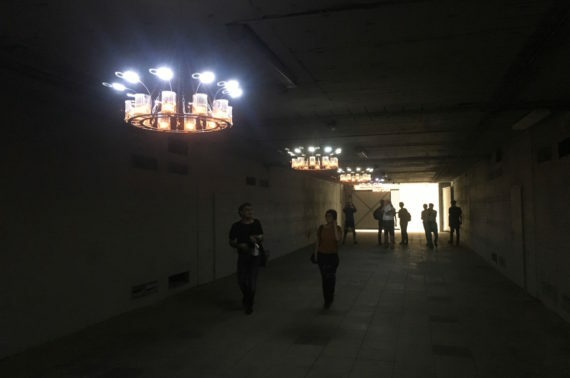 Once inside, the underpass is lit by a series of chandelier-type lights hanging from the ceiling. Each ring contains a collection of burning tea-lights. However, it’s not the light these give off that’s of concern but the heat, which is converted directly in to electricity that powers rings of LEDs to illuminate the space. On one level a fairly simple, and arguably pointless, display of classroom science – you could ask why convert the heat to light when then tea-lights already give off light? But that would be to miss the point and beauty entirely and these UFO-come-chandelier sculptures really are quite beautiful. The other two works similarly engage with this conversion of fire and heat to electricity, and near the Pumpenhaus provide the opportunity for you to charge your mobile phone while taking a break or visiting the work of Gintersdorfer/Klaβen. 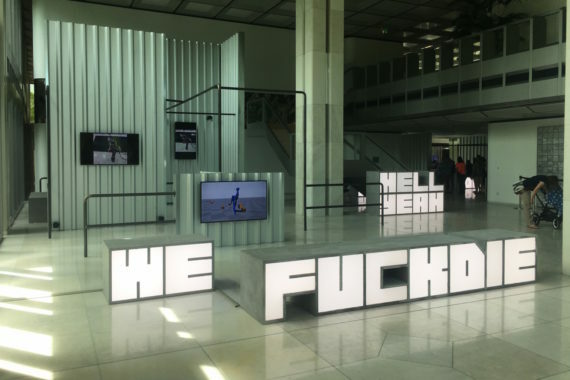 Hito Steyerl is one of those artists who’s cheated on the sculpture trail and gone for a full installation in the foyer of the LBS savings bank on the edge of Münster’s green promenade. That said, it’s an entirely fitting site for a work that, on first glance, feels quite clinical and distancing but quickly reveals a humour and dystopian critique of our relationship with technology. Videos of our long-proposed technological-saviours, human-shaped robots, contain footage – actual and simulated – of our auto-selves undergoing tests to see how well they withstand being pushed over or having things thrown at them. Not so well it would appear. 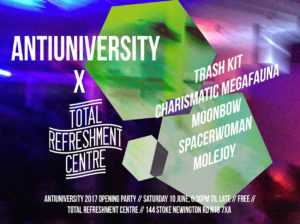 Dotted around the space are three-dimensional renderings of the title, in concrete and illuminated Perspex, bringing a gonzo feel to the whole thing, as though we might be in the lab of a nihilistic technological genius. The calculated layers within the work, driven so much by a cold-pragmatism, come together in the sum-of-their-parts to reveal something that could only be constructed by a living, breathing, illogical, human brain. 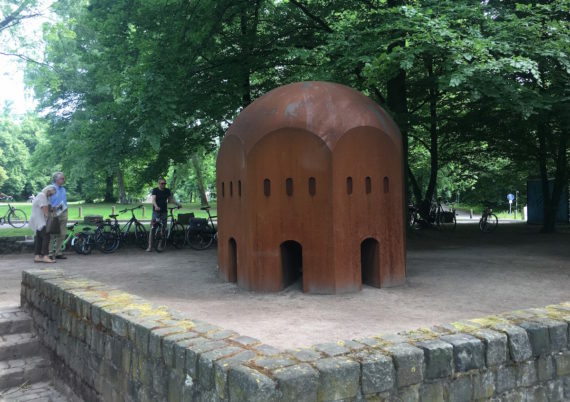 Across the road from Steyerl, nestled just inside the greenery of the promenade, is Thomas Schütte’s oxidized-steel Nuclear Temple. This is a metal dome that feels like an architectural proposition or model and is a nice partner work to Steyerl. As busy and anxious as Steyerl’s work is, there’s a calm simplicity to this piece that can be read in many ways, one of which must surely be a future vision of a post-nuclear age, in every interpretation of the phrase. Whereas Steyerl revels in the complexities of how technology and man fit together or not, this work contains a very human proposition that, once again, may be the legacy of our illogical human brains. 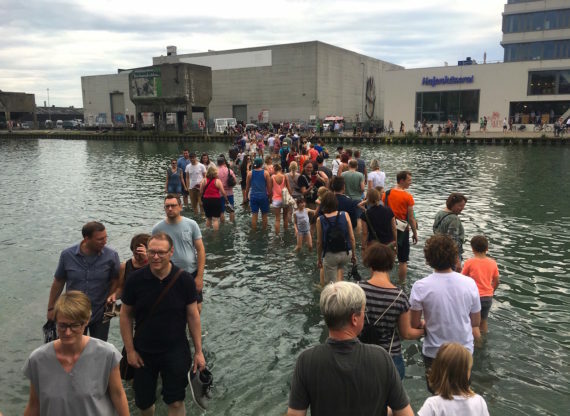 On arriving at the harbour, streams of people are seemingly walking on water from one bank to the other. Quite apart from the obvious walking-on-water connection, there’s a religious feeling to this sight, something akin to people bathing in the Ganges or some other such spiritually important body of water. 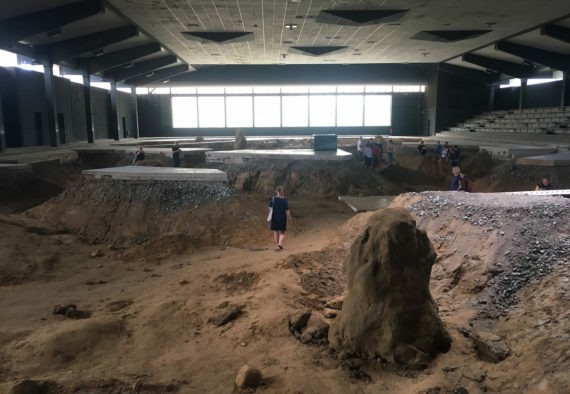 At the same time the work speaks of a pilgrimage or migration and the impossibility of the task being undertaken, were it not for the short walkway that Ayşe Erkmen has introduced just below the surface of the water connecting the two sides of the harbour. The opportunity to walk from one side to the other provides an entirely shifted perspective on the usual physical relationship that’s possible within the space, at the same time forcing people in to a communal act or experience. There is unadulterated joy on most people’s faces as they experience this simplest of pleasures – essentially going for a paddle. The dogs encouraged across by their owners look less sure. 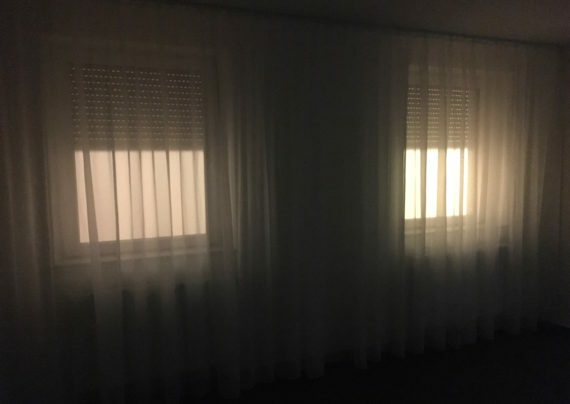 Gregor Schneider provides an unsettling domestic experience, accessed individually through a door at the side of the LWL-Museum. There’s trepidation in the queue, particularly as the people coming back out don’t necessarily reappear in the order they went in. Up some stairs is an entrance to an empty flat – empty of other people, furniture or much light. Moving through the two reception rooms the instinct is to look for additional clues to inform the experience before passing in to a bathroom, complete with dripping shower and the urine of the former resident in the un-flushed toilet. I’ll spare any more detail at risk of being the person telling you that Bruce Willis is a ghost at the end of The Sixth Sense. Suffice to say that Schnieder really is a master at providing an emotionally unsettling experience, without ever falling into the trap of being hammy or shocking. The experience is at once entirely familiar and completely alien, much like a nightmare in a domestic setting.